You want to make an impact in the community. Whether it’s with a one-time contribution or through a philanthropic partnership, your next step is to select the right philanthropy for your business. What cause should you support? To whom should you donate? Where do you even begin? The first and most important step in identifying a cause to support is to look internally to find a cause you’re not only passionate about, but that is a good fit for your business. Define and clarify your business values and mission statement. Doing so will help you see a connection between your values and the values of the cause you should support. Having a clear mission and defined values will also allow you to more easily identify goals for your business and the partnership. After your values and mission have been refined, extend your research to stakeholders. Dig into stakeholder and consumer donations to find out where they’re donating and what they support. You’ll want to select a cause that matters to your customer base to demonstrate that you tuned into, and support, what they care about. Don’t stop at stakeholders, be sure to include employees as well. Consider their concerns and look into the causes that most interest them. Working with charitable causes your team cares about will excite employees and garner more support and participation with the project. You’ll want to get their buy-in and hear opinions again before finalizing your partnership, too. For now, you can get a general idea of what cause will be the best fit among employees. Later, let it up to a vote to see which charity employees are most passionate about. Once you’ve got it narrowed down to a cause you’d like to support, it’s time to choose a charity. Based on the criteria you’ve set forth, create a list of charities. Use tools like GreatNonprofits.org, Philanthropedia and GiveWell.org to search non-profits. Identify the charities that meet your requirements and build a list. Try to widdle it down to the best fits; the charity you choose to work with needs to be a good fit for your industry. Be aware of all possible issues that could arise in the eyes of the public. If you’re a business that sells hunting gear, you wouldn’t want to pair with World Wildlife Fund, for instance. Transparency and Accountability: Is the money being spent as promised? Are financials being tracked and are they transparent? Make sure money is going where it’s supposed to, and in a timely fashion. Be careful that you’re not placing too much emphasis on overhead, though. While the charities that are often considered the “best” have the lowest overhead, focusing too much on that may prevent the charity from making a significant impact. Ease of Process: Is the charity reducing obstacles for your team, or are they creating more? Are they addressing your needs? The staff should be able to address your needs and eliminate any extra work on your part. Ideally, they should be using tools to manage your CSR campaign that streamline processes on your end and on theirs. 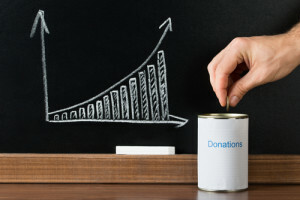 Return on Investment: Can the charity show a return on investment? You should be able to show a return on investment for the philanthropy partner. Ask yourself if the partnership makes more sense than having an in-house team to carry out the projects. Are they saving you time and money by working with them? You must able be able to show a return on your CSR program. Determine whether or not the impact on the community is in-line with your business goals. Legitimacy: Is the charity registered with the IRS? You’ll need proof that the charity meets the criteria for tax-exempt organizations. You can determine legitimacy and accountability with sites like The Better Business Bureau, CharityNavitagor.org, GuideStar.org, Charity Watch and the Charity Review Council. If you can’t locate the proof online, ask to view their letter of determination. You should also use a charity-rating tool like CharityNavitagor.org or GuideStar.org to get a rating and financial reports. Once you’ve got your list narrowed down to the top three or so, take the time to conduct in-person interviews with each. Tour their facilities, get to know the people involved, and have a meeting so you can ask the burning questions you still don’t have answers to. See, in person, what progress they’re making towards their goals, how they work to get there and how they measure their progress. Before you leave, do a confidence check. Assess your comfortability and excitement. You should only work with a charity if you’re 100% comfortable working with them and are excited by the work they’re doing. Finally, do a trial run. Test with a smaller project or donation prior to a large campaign. You’ll want to note how the charity works, how trustworthy and transparent they are and how well they interact with your team. Set a donation you can sustain. In a good year or bad, can you sustain what you’re promising to the charity? One way to make sure is to give a percentage of profits. That way, you’re never coming up short. Whatever you do, avoid overpromising and under-delivering, it puts the philanthropy – and you – in a bad situation. Implementing a CSR campaign is an exciting endeavor, but one that is not to be taken lightly. Taking the time to identify the best philanthropy to partner with can make a world of difference in the success of your project.